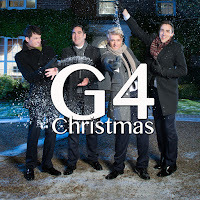 We (G4) are incredibly excited to be releasing a new album “G4 Christmas” and to take this album on the road for eight exclusives dates in historic churches and cathedrals across the country on our “Christmas By Candlelight” tour. We plan to record this, our fourth album, in one of London’s historic churches where the natural acoustic enables the human voice to truly shine. We will be taking timeless classic Christmas songs and adding our distinctive signature G4 twist. We will be accompanied by some exceptionally skilled and talented instrumentalists invoking a real festive feel, promising to help capture a very special album that will hopefully resonate with many for years to come. We're also delighted to be performing at the Home for Christmas appeal launch dinner and auction at London's Corinthia Hotel on 5th November. We will be singing a short set of popular and timeless songs, including Bring Him Home from hit musical Les Miserables. In addition, we are donating an auction package of VIP tickets to our Christmas By Candlelight concert in London. G4 singer, baritone Mike Christie has performed solo songs in both 2012 and 2013 at the Missing People Carol Service at London's iconic St Martin-in-the-Fields. Speaking about the charity, Mike says, "Having worked with Missing People before, I've met a number of people who have benefitted from the support of the charity, and I've been incredibly moved by their stories. Christmas is a particularly difficult time for those missing loved ones, and I'm very pleased to be continuing my association and to establish a link between the group and a charity whose values I hold dear." One of the things that we enjoy most is the joy, intimacy and interaction of live performance. “G4 Christmas – By Candlelight” will take us around the country in November and December, and those buying tickets have the option at checkout to add a donation to Missing People. In addition, there will be representatives from the charity at all of the dates, organising a bucket shake at the end of each concert, offering the audiences a chance to really make a difference this Christmas to help provide a lifeline when someone goes missing. We are hoping to discover some of the UK's youngest singing stars to join us live at each of our “Christmas By Candlelight” tour dates. 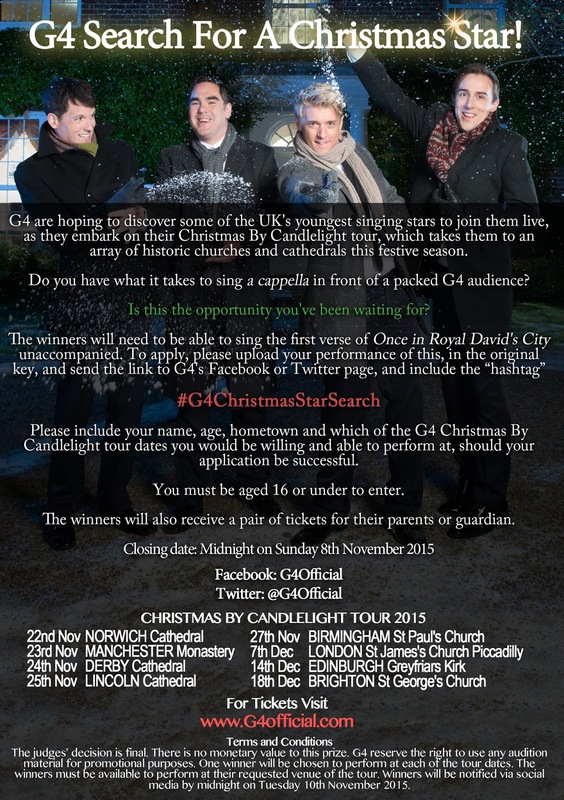 The chosen eight singers will need to be able to sing the first verse of Once in Royal David's City unaccompanied, so to apply, please upload your performance of this, in the original key, and send the link to G4's Facebook or Twitter page, and include the hashtag #G4ChristmasStarSearch. Please include your name, age, hometown and which of the G4 Christmas By Candlelight tour dates you would be willing and able to perform at, should your application be successful. You must be aged 16 or under to enter and the winner will also receive a pair of tickets for their parents or guardian. The closing date is midnight on Sunday 8th November 2015. Thank you for reading our post for the Missing Blog. It really is a pleasure for us to be able to give something back and to help such a worthy cause.